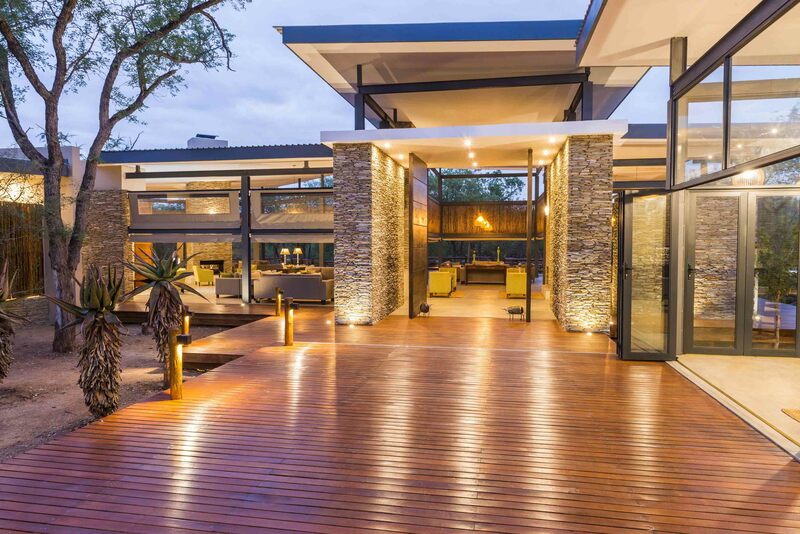 Urbane in an African contemporary kind of way, the 4-star Makalali Main Lodge is more hip design hotel than traditional safari camp. You won’t find old Colonial pith helmets or hunting trophies here, just a sense of light, space and clean lines encouraging flow between the airy interiors and wild outdoors. A library where you can kick back with a book, enhances the calm, unhurried atmosphere. 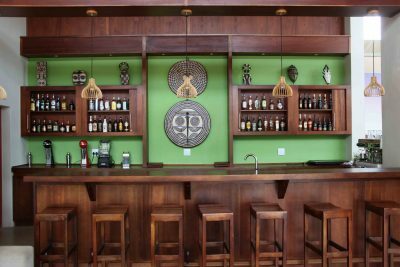 Bar at Makalali Main Lodge. 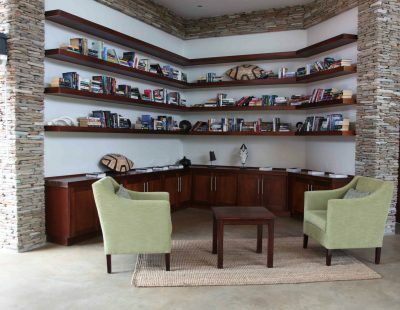 Dry stone columns, huge fireplaces and wild sisal rugs add an elemental feel to the overall modern freshness with luscious touches of lime in the cushions, back walls and witty African sculptures with hints of the Tswana vernacular. 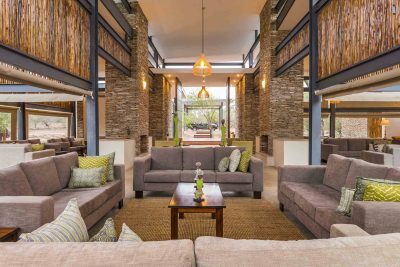 Makalali’s modern main lodge living area with luscious touches of lime in the cushions, and witty African sculptures. 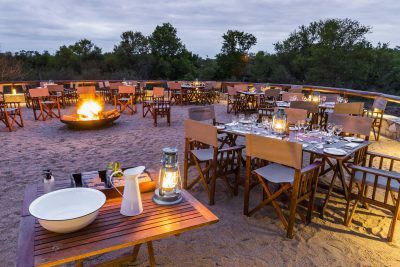 Built from natural materials, much of it sourced from the banks of the Makhutswi River, the Lodge is understated, yes, but still chic. Stylish, and authentic in its artful simplicity, there’s a sense of being rooted in the culture of the land, an ethos continued in the seasonal menu that offers traditional African fare such as grilled crocodile or lamb curry served in an open-air boma, or on the wooden deck under a diamond-studded night sky. 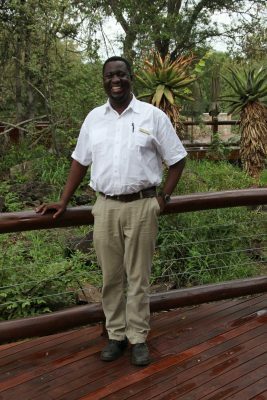 Of course, the real stars here are the affable staff,from operations manager Thomas Ndobe to rangers and trackers like Johnson Ntimane and Elias Moagi who have spent decades in the bush. 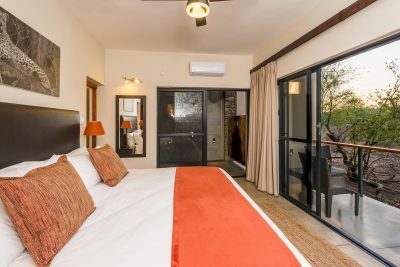 Our superior room, one of 30, felt welcoming in a neutral palette to allow the fantastic view from our floor to ceiling glass sliding doors take centre stage. 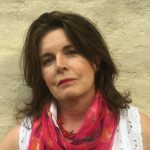 Dawn’s finger beckoned with a blushing sky as we left on a game drive where we found a bull elephant, two lions and a journey of 23 giraffe that eyed us curiously as we drank our Amarula-laced coffee in the bush, once the lions had moved on. On other drives we saw a jackal, more lions, hippo, rhino, and a python in a tree, with marvellous bird sightings of African hoopoes, woodland kingfishers, yellow-billed hornbills and a hammerkop, a brown stork-like bird that keeps its eggs in a big untidy nest decorated with old bones and shiny found objects. Local legend dictates that a family member will die if a hammerkop flies over their hut but this one was simply surveying, as were we, wildebeest and zebra chilling on the plains together. Theirs is a symbiotic relationship. 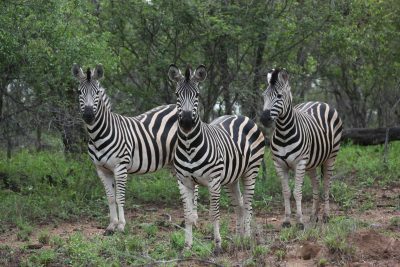 Not only do they eat different parts of the grass but the zebra’s good eyesight and wildebeest’s excellent hearing boosts the survival chance of both species against predators. Mongooses and hornbills also enjoy a symbiotic relationship, the latter acting as sentries for the little mammals, calling if there is danger. There’s a lot to be said for pooling skills. 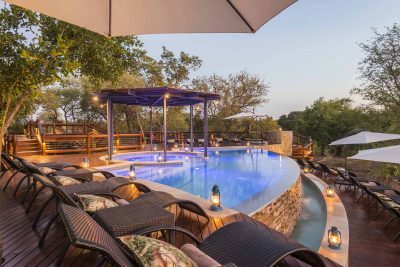 Talking of pools, Makalali’s large crystal blue rim flow pool is spectacular when lit up at night, although earlier we thought twice about having a swim as a proprietary baboon seemed to have annexed it from the edge. We gasped when a warthog family suddenly burst out of their burrow leaving clouds of dust in their wake – mum and dad bolting in one direction, then piglet squealing off in another. Warthogs go backwards into their burrows so they can use their tusks, easily sharp enough to slice off a finger, against any predator foolish enough to enter but that’s definitely not the way they emerge. 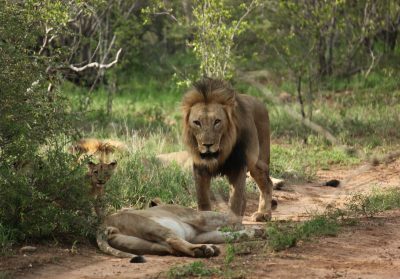 We saw lion, cheetah, rhino, hippo, jackal, kudu, waterbuck, giraffe and even a civet stalking something in the tawny grass. 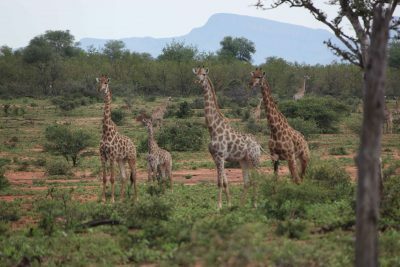 Just west of the Kruger Park, Makalali Private Game Reserve is an hour’s drive from Hoedspruit and its airport.